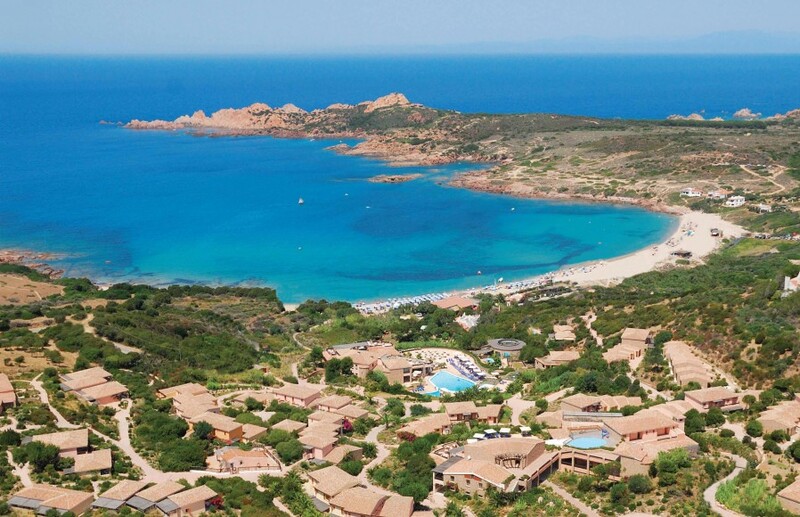 Delphina Hotels 5* Freedom – Sardinian Style | The Review Magazine. Life. Style. 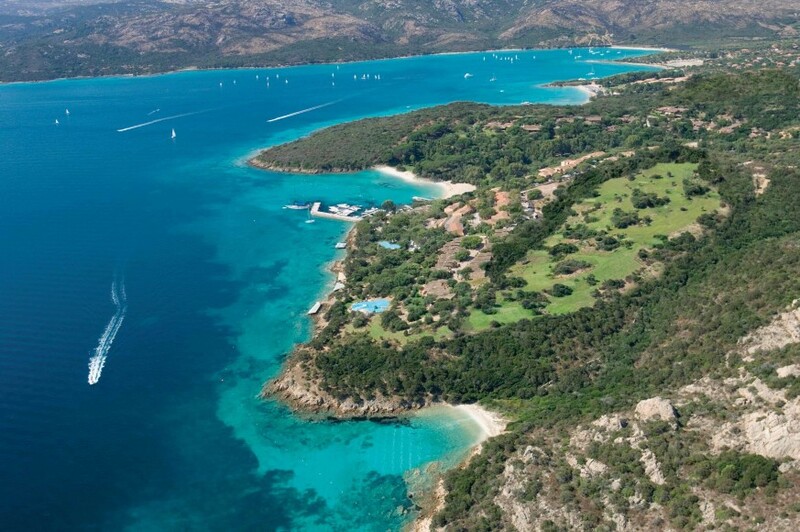 I had once again decided that this was the summer I would finally kick the habit of trying any and, more importantly, all food put before me when Peter (Ed) asked if I fancied popping over to Sardinia. My virtuous resolution at once gave way to voracious temptation and, before long, I was flying to the north of Sardinia in expectation not only of culinary delight, but to experience Sardinia’s renowned coastal beauty, the welcoming hospitality of its people and the longevity-inducing, sense of freedom that this island evokes. 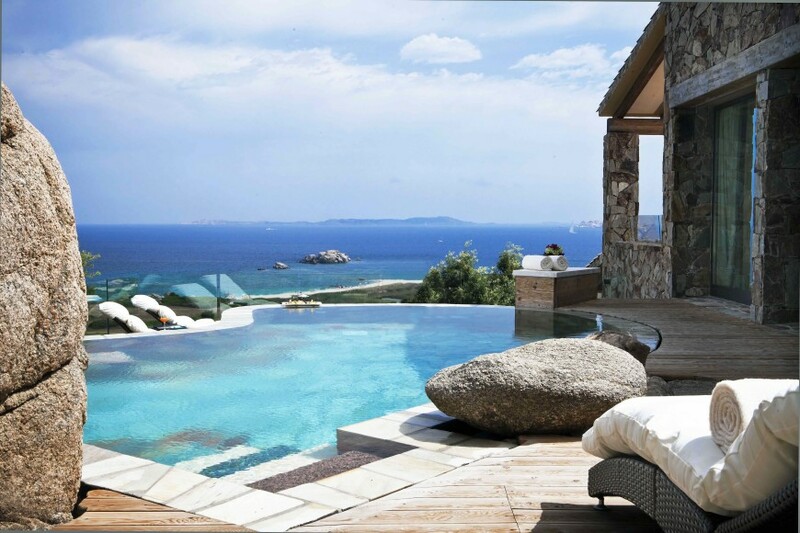 Delphina Hotels met these expectations and more. 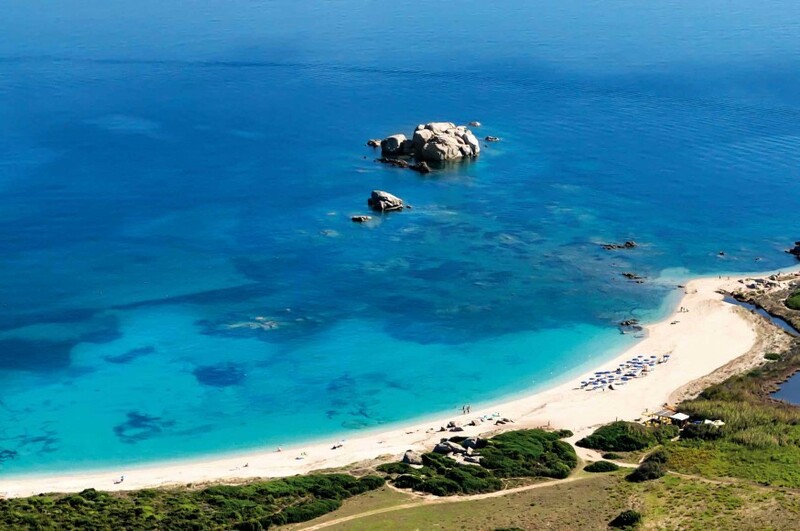 Sardinia, although politically a region of Italy, is ethnologically distinct. 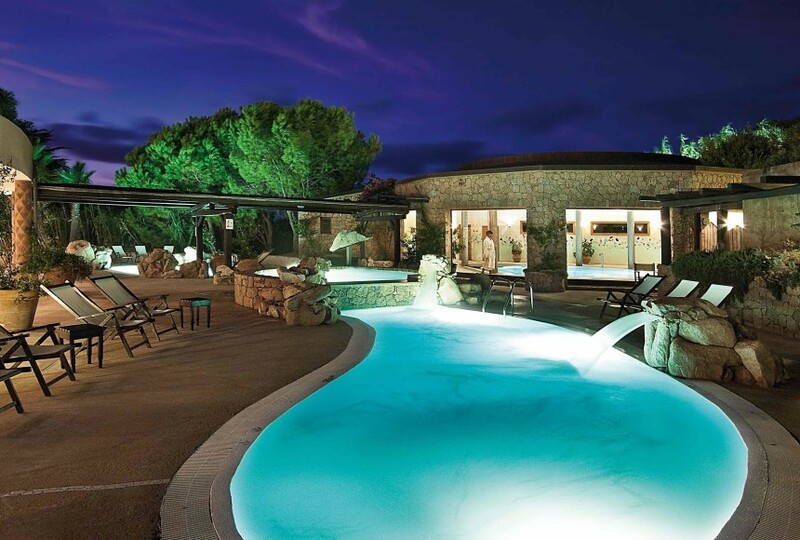 This family-owned business, consisting of eight 4 and 5-star destinations across the north coast, is proud—and rightly so—of Sardinia, as well as the Gallurese locality. Such pride is evident across the Delphina group. Externally, the aim of the hotels’ design is to disappear into their respective landscapes, with locally sourced building materials helping integration with the natural surroundings. When I first heard this at the Resort Valle dell’Erica, I was a little sceptical, standing on a rather large and modern terrace next to the reception and overlooking the resort. However, as I spent more time at the resort it felt more like a small coastal village, a feeling which deepened when I saw the resort and reception from the coastal path; it really does sit beautifully. Internally, the design aim is to incorporate heritage into luxury, highlighting traditional handicraft skills through Sardinian masonry, art and artefacts, such as rugs, baskets and ceramics. There are diverse ways of offering luxury and Delphinia favours the rustic and discreet with the result feeling welcoming and unforced. Some might argue my tastes are unrefined, but we have all experienced a building or a restaurant where the idea of luxury suggests an intention to outshine and outspend the Vatican—Delphina proves there is really no need. Nevertheless, despite the themes of heritage and locality running through all the Delphina hotels, each location offers something different. Delphinia’s true philosophy is the freedom to choose. 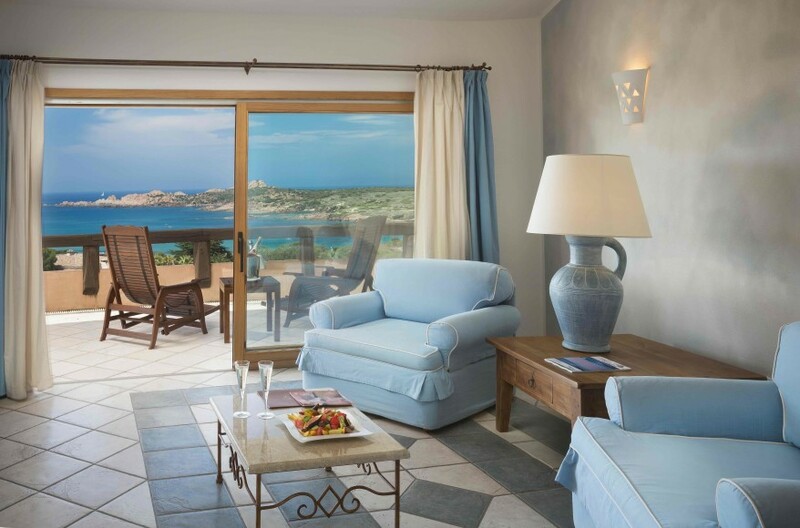 I visited three of the eight locations— the Resort Valle dell’Erica, Hotel Capo d’Orso, and Hotel Marinedda—experiences for family, for romance, and for rejuvenation. 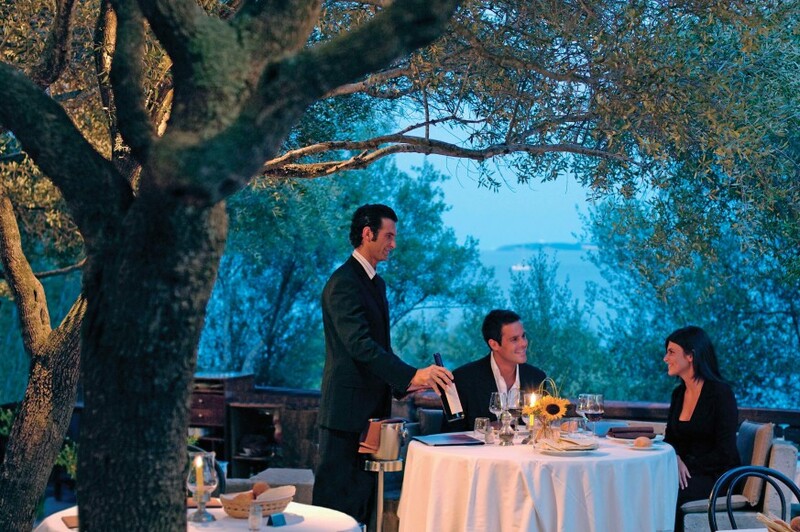 The 5* Resort Valle dell’Erica comprises of two hotels: Hotel Erica and Hotel La Licciola. In total, the resort has 271 bedrooms which was surprising, it does not feel or look like there are that many. 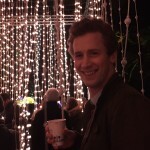 Similarly, it did not feel like there were another 650 other guests staying at the same time. This is because again, the resort does not feel like a one; the village feel equates to a sense of population rather than crowding. I saw other guests at breakfast, or came across them at the beach, but for the most part, it felt like a private location of one’s own. This is particularly important if you consider that this resort is a family one. Delphinia provides a wealth of activities to keep children occupied, such as canoeing excursions to a ‘deserted’ island—for those parents keen to wave toodle-oo to their offspring—and the Mini Club Ericaland, checked out by a lone member of the press group one night, the rest of us less keen to walk into the lion’s den, who informed us that it looks like a rather happening club—perhaps we were missing out. In retrospect, we were not. The resort offers plenty of distraction for those unable to swing entry into the club. 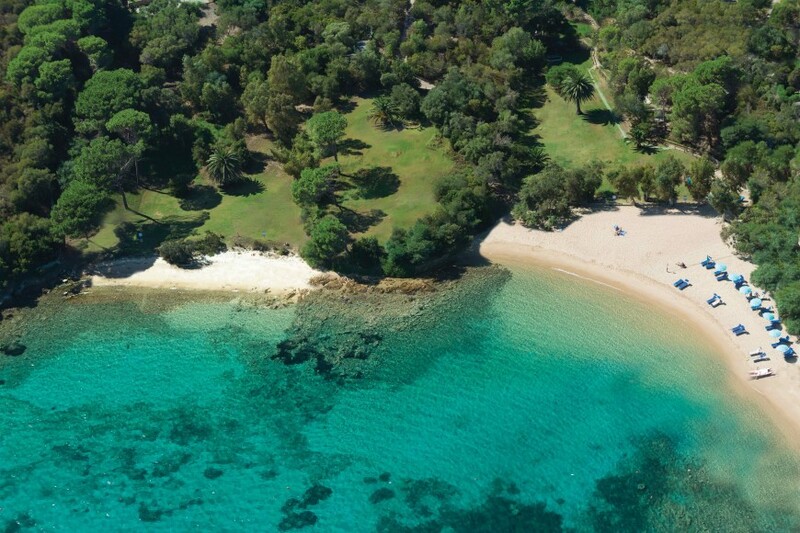 The resort, although only 28 hectares, has 1.4 kilometres of fantastic coastline and benefits from nine private coves and a large beach meaning that you can visit a different stretch of sand each day. The sea, much like the Caribbean, is a combination of translucent malachite, encouraging the confidence to swim, and deep azurite, mysterious and daring. The colours are striking whether viewed from boat, shore or from the short trekking route along the coastline. I thoroughly recommend doing the latter to experience il profumo of the sea and Sardinia at your leisure; run your hands along the myrtus communis, breathe in the scent of myrtle and salt. Relax. Unwind further in your room; spacious, subtle, and inviting. The sea view was not spectacular—it was something better than a spectacle—peaceful. At night, I left my curtains open so that each morning, the warm orange light of sunrise would flood my room, and, from my bed, I could watch sailboats gently swaying at their moorings. 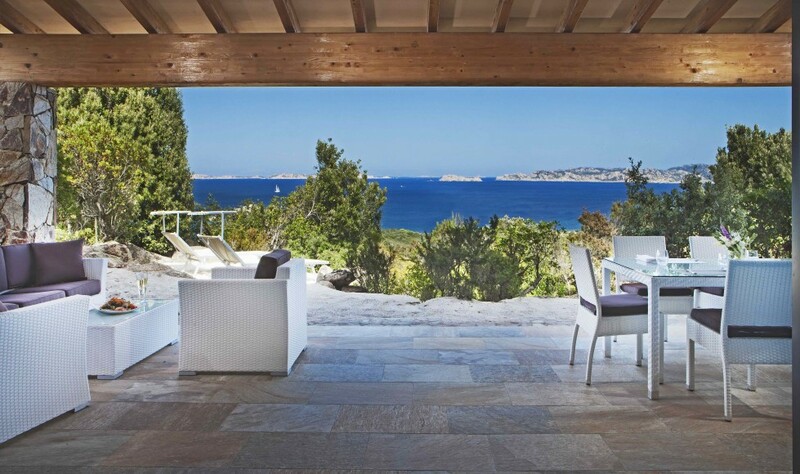 A quick snooze of two hours would always follow and after finally rising, I would sit, with an espresso, on my veranda, and watch as the boats sailed on against a backdrop of the Archipelago of La Maddalena and southern Corsica. My feelings were of complete calmness; it was as if my veranda was one of the sailboats, secure in the knowledge that land was just yonder but also able to enjoy my perfect solitude. I took a literal, as opposed to metaphorical, boat ride to the Archipelago; one of the many excursions offered by Delphina. 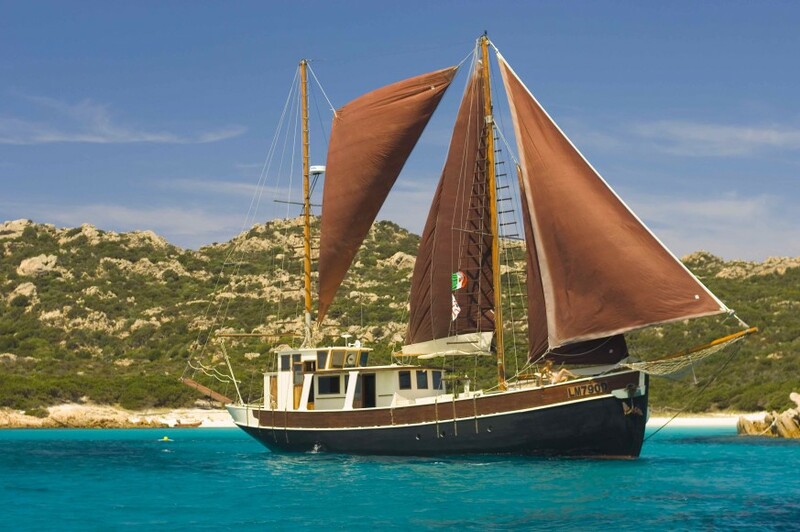 The Archipelago has only one inhabited island, Maddalena, but many small coves and beaches where one can moor a boat and swim. From the boat you can really appreciate the topography of Sardinia—great boulders of granite rock, many appearing to precariously balance on top of each other, punctuating the macchia carpet of Mediterranean green, sunshine yellow and myrtle white. 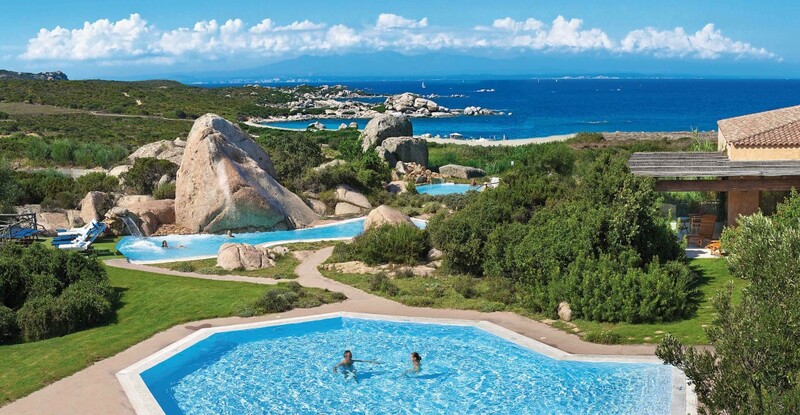 Over time the granite forms zoomorphic shapes and overseeing the Hotel Capo d’Orso is a giant bear from which the hotel derives its name. 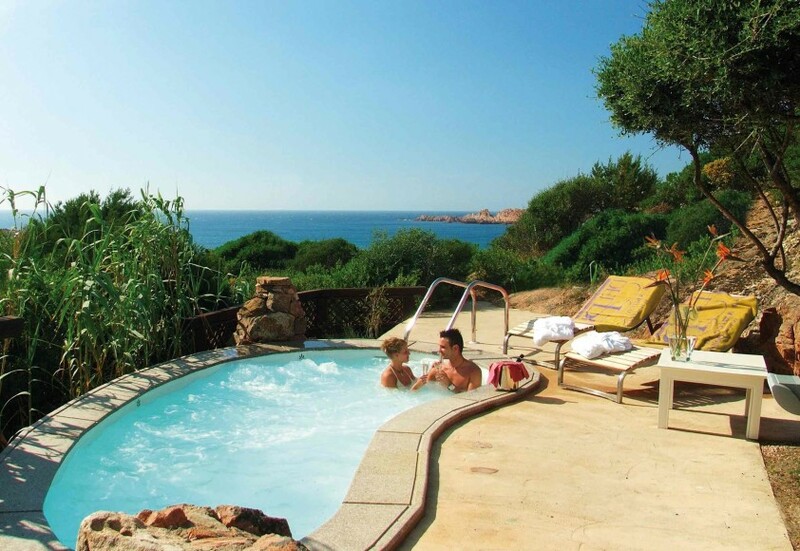 It is easy to see why this spot is one for romance; Delphinia takes seclusion to a new level at Capo d’Orso. This Mediterranean forest of flora—olive groves, junipers and, of course, more myrtle—is romantic to walk around. The hotel is deliberately small, at only 86 rooms, complete with private veranda to watch the sunrise. 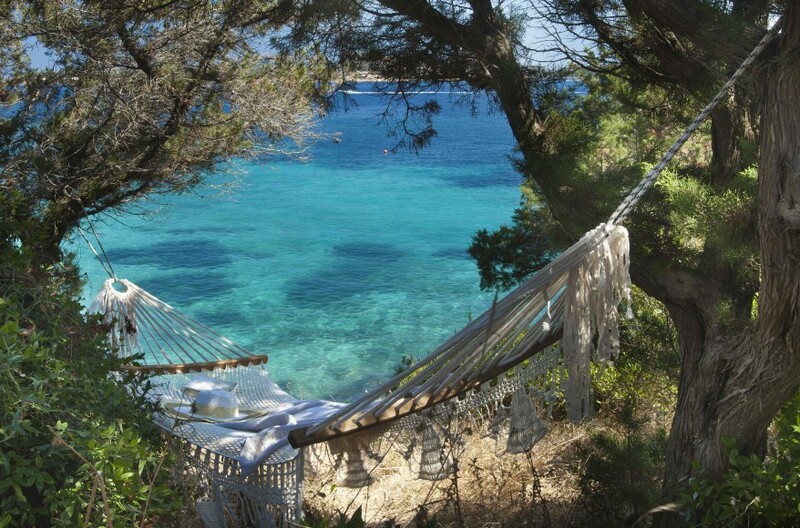 Delphina further encourages privacy by the number of intimate spots that you just happen to come across, with hammocks or sun-loungers, big enough only for two. 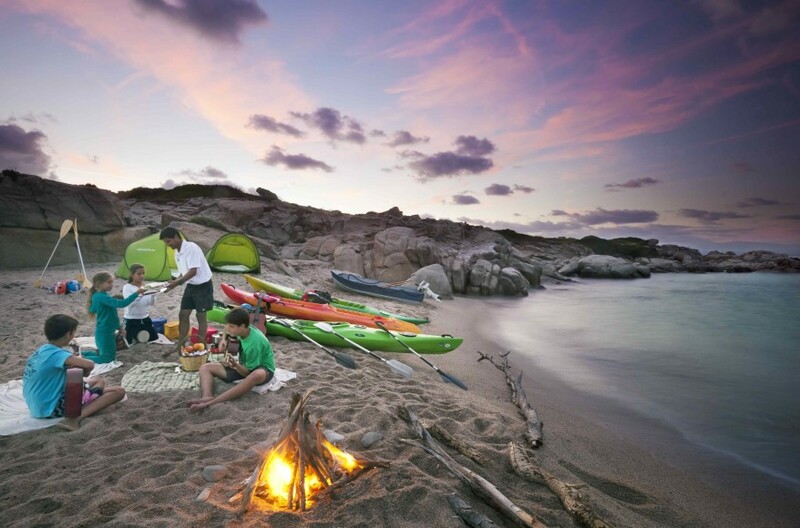 There are also five wooden sun-decks to float on and two beaches, Cala Capra and Cala Selvaggia, to enjoy. This privacy means you pass by, but do not interrupt others, and vice versa. 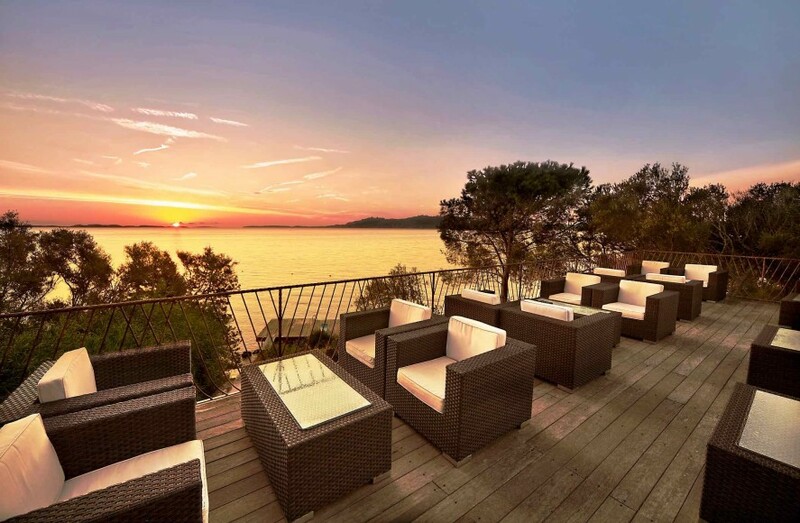 If you wish to catch the sunset rather than the sunrise, visit Hotel Marinedda in the north-west. 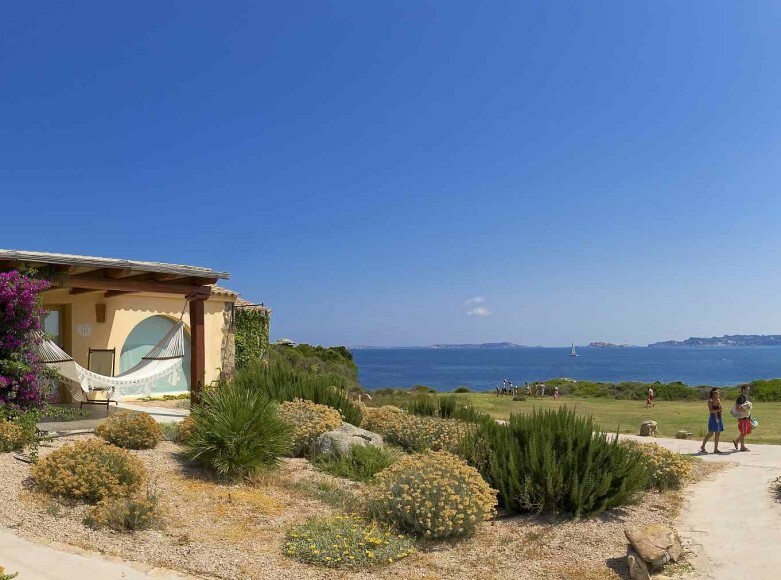 Larger than Capo d’Orso at 195 rooms, but more compact, the landscape here is rural; an explosion of plant life against rose granite rocks, violently eroded by the wind and slashed across the sea and the crisp white beaches. 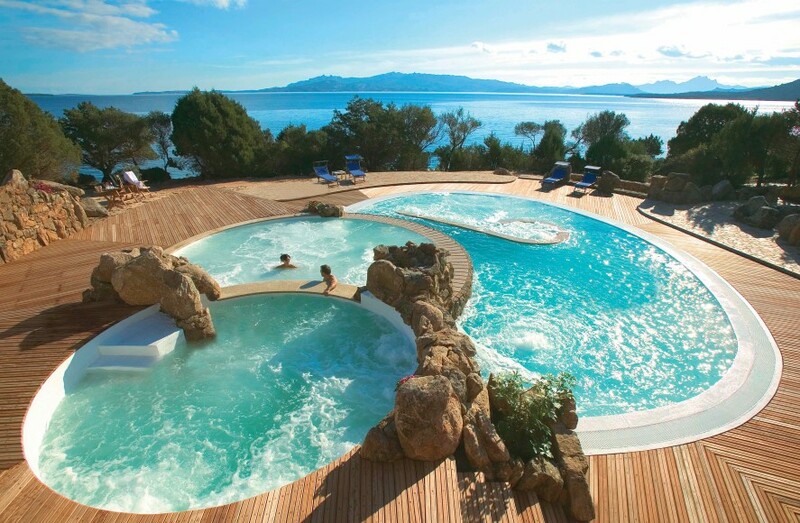 Despite the wilder location, Hotel Marinedda is home to the largest thalasso spa of the Delphina group, and one of the largest in the Mediterranean, with 2,500m² of dedicated space for spa facilities. Available at all three hotels, thalassotherapy uses purified sea water, heated to varying temperatures, to relax, rejuvenate and refresh the body. 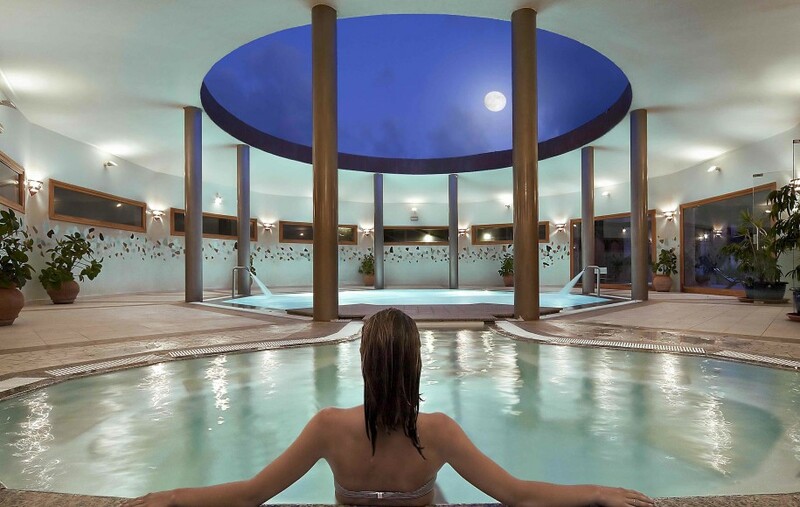 Dip into the pools after working hard in one of Delphina’s fitness suites, or do what I did, and use the pools to further luxuriate after treating yourself to Sardinian beauty treatments such as the ‘indocéane’ body scrub and relaxing massage with Mediterranean essential oils. For some, such as myself, the strength of a holiday depends on the culinary experience on offer. My well-being depends on being well-fed. Virginia Woolf wrote ‘one cannot think well, love well, sleep well, if one has not dined well.’ If we take it as axiomatic that clarity of thinking, vero amore and sound slumber derives from the quality of your table then it is little wonder that the Sardinian lifestyle equates to longevity (the Sardinian population has one the highest number of centenarians worldwide). 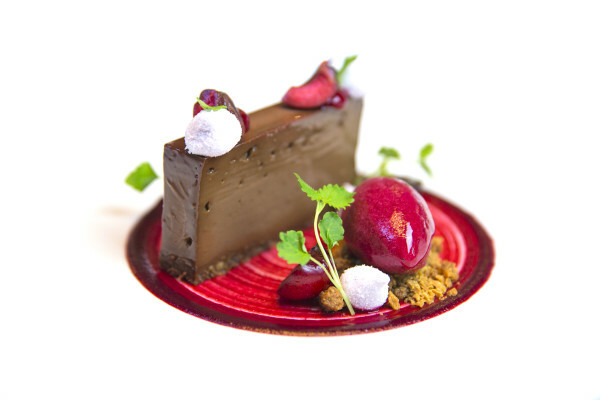 The food is a reflection of Delphinia’s determination to keep things local and green (in the environmental sense), aiming to source food both seasonally and under a ‘zero-kilometre’ distance policy as much as possible. 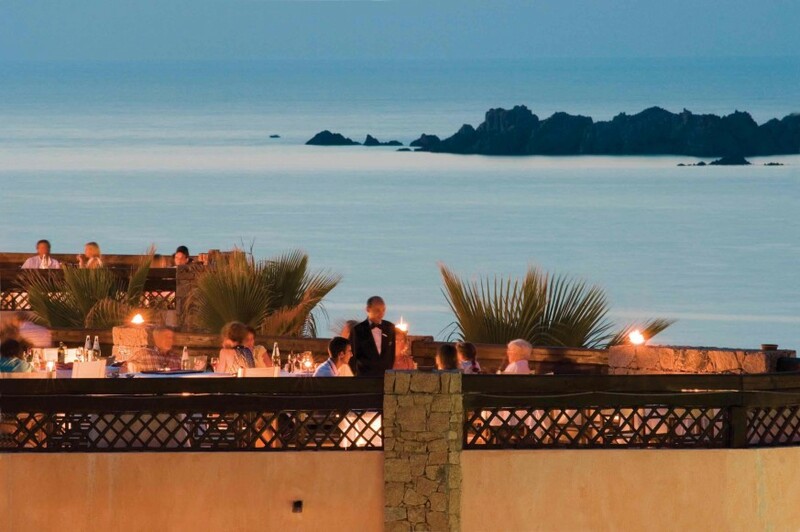 Whilst staying local, the Delphinia culinary experience is where freedom to choose really comes into its element. 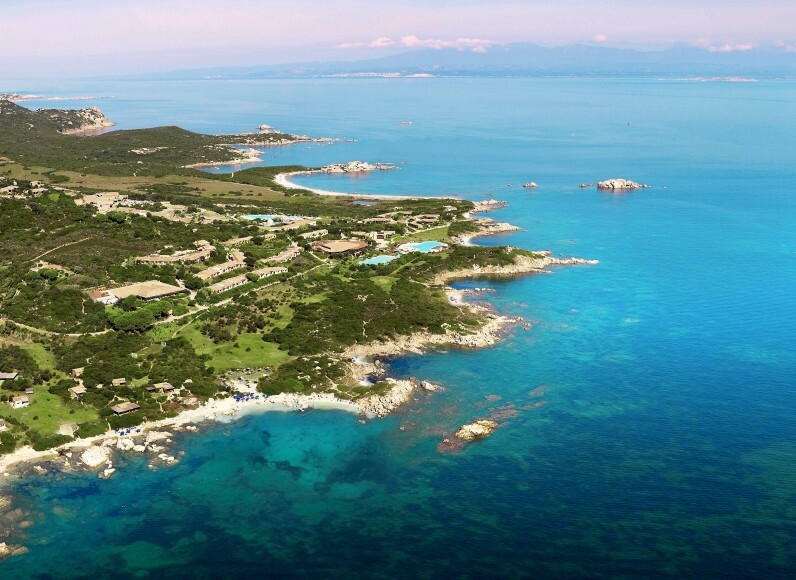 The first choice is which restaurant to visit: at the Resort Valle dell’Erica there are seven; at Capo d’Orso, sadly only two and pizzeria; and at Hotel Marinedda, three and a further pizzeria. 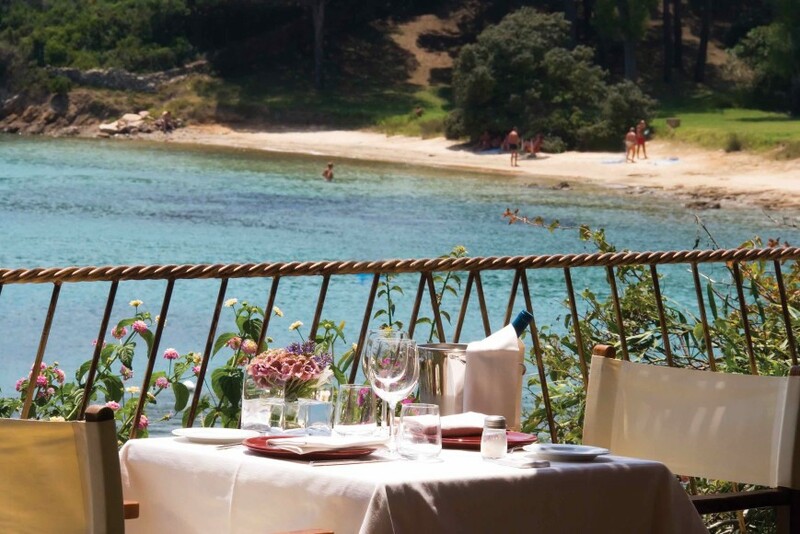 The gourmand in me was awfully glad to be staying at Valle dell’Erica although, the two meals had at Capo d’Orso and Hotel Marinedda, proved that a good table is to be had by all. Les Bouches, in the Licciola area of Valle dell’Erica, was the setting for our first dinner and each morning’s breakfast. This is a buffet restaurant however, I ask you to obliviate all memories of buffets; this is Sardinia, and this is a 5* hotel. Buffet means freedom to engross yourself in every type of Italian goodness it is possible to. Of course, there are endless cuts of cured meat and fresh or hard cheese to graze on as you decide which of the twenty or so starter dishes you wish to consume. Barracuda, cuttlefish, swordfish… choose them all, be a glutton. Savour these bites of fresh seafood, whet your appetite for the pasta course, again chosen by you (mussels and clams) and made as you watch. 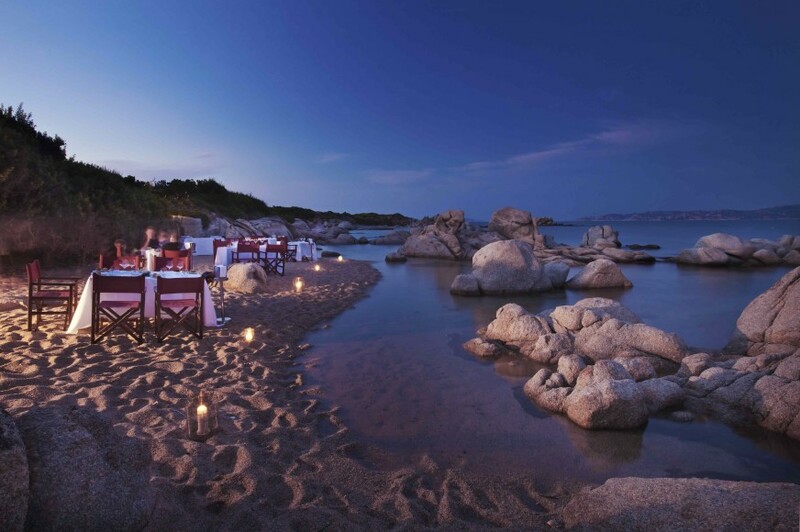 Remember this is Sardinia, pasta is only il primo so return to the buffet for il secondo. Stop in your tracks as you spot a palette-cleansing plate of fresh buffalo mozzarella in a tomato gazpacho—take as sensible preparation for the fish course. Brown meagre or bluefish? Again, go for both, the chef chooses it each day at the fish market. Finish well with a large helping of tiramisu. Use the good night’s sleep to wake up feeling fresh for breakfast. Take it easy, drink coffee as you sit on Les Bouches’ terrace facing the Straits of Bonifacio and feel only the pressure of deciding which type of eggs to go for. Personally, the scrambled eggs with chive—again made fresh in front of you—and a side of smoked swordfish and tuna was spot on. For seconds, go healthy with a bowl of yoghurt topped with plums and apricots, and pretend banana bread is something you eat every day for breakfast. Lunch at Il Paguro, Capo d’Orso, was a chance to widen my poor English understanding of pasta. The primo of loreghittas, rings of braided pasta, served with red prawn and courgette was elegant, complementing the good helping of Vermentinu in my glass. A fish secondo of Mediterranean-style, grilled amberjack followed, complementing the view of the sea, Cala Capra and the private marina. Dessert was the now clichéd—but never unwelcome—chocolate bowl melted by wild berry coulis, complementing the whole meal. Compliments to the chef. It was sensible to go à la carte for lunch as dinner was traditional dining at Valle dell’Erica’s Li Ciusoni. Visiting feels like an invitation to a jovial family celebration; a woman makes acciuleddi dessert braids in a traditional basket, a wood-fire oven fills the air with fragrant smoke and the smell of suckling pig, and a traditional Sardinian band play. This is feasting, Gallurese style. First course is zuppe gallerese, a hearty dish translated as soup but is more a lasagne made with bread—confusing, but great—and ravioli stuffed with Pecorino cheese. Second course brings the suckling pig to the table with, in case you need it, a S’Artizzu pork sausage and roasted potatoes. When I first saw the porcheddu on the spit, my eyes told my brain I could easily eat the whole animal but, when it arrived at the table I wondered if pigs still suckled after reaching the size of a hippopotamus considering the portion placed on my plate. I am no quitter however, and the pig was polished off. My pasta education further expanded with the dessert course, of seadas and the acciuleddi, where I discovered that pasta stuffed with cheese is a dessert so long as one covers it with sugar or honey. ‘Why not?’ I say to myself. Brunch the next day at Petra Ruja, Hotel Marinedda, was part buffet, part chef speciality. I used the buffet to take advantage of the plentiful meat and cheese counters, saying yes to everything that was recommended and asking pointed questions about meat and cheese not yet on my plate. The highlight of the meal was the specially made fregola, with mussels and clams, cooked in Sardinian saffron broth, exemplifying just how light pasta dishes can be. Il Nautilus was the setting for dinner, to display the buffet restaurant of the Hotel Erica side of the resort, and for a change of scenery, the Archipelago of La Maddelena taking prominence over the Straits of Bonifacio. The options have changed, based on the fisherman’s catch and local ingredients. Goat ragù made pasta selection easy and a whole grilled squid for the second course almost finished me off. Pistachio and hazelnut gelato was the only feasible dessert I could manage, as other guests had proudly and disappointingly demolished the tiramisu. For me, the most beautiful of the Valle dell’Erica restaurants was Li Zini, situated appropriately behind the Caletta Le Piscine, close to the shoreline. The restaurant is small and intimate, feeling like a private al fresco veranda, and the perfect place for lunch. The seafood first course arrived in large bowls for sharing: octopus salad, prawns and peaches, more steamed mussels and clams. Delphinia Hotels have proven that mussels are never a sorry sight at the dinner table. Its beauty lies in simplicity, letting the wonderful view and good conversation provide the entertainment. The final restaurant of this piece is Il Grecale, visited for both dinner and lunch. If I am being honest, I felt it lacked a bit of atmosphere at dinner time, however, this completely changed the following lunchtime, in part because one can now see the Archipelago. Nonetheless, dinner at Il Grecale was not lacking, the à la carte menu gives choice, but not overwhelming choice. I knew at once what to have: shi drum and coconut; tallutzas with beef and gorgonzola; and chicken with curry and mushrooms. 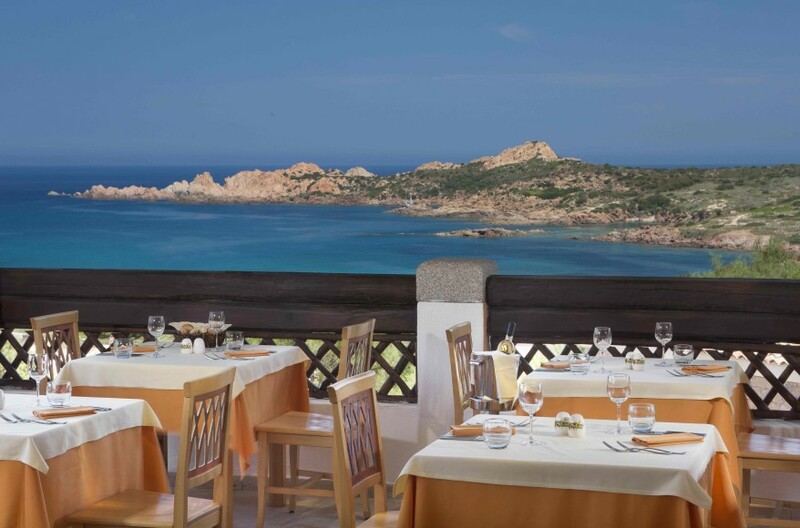 The menu shows the Delphina’s chefs are not afraid to take inspiration from beyond Sardinia’s borders and know how to execute this inspiration within their own culinary culture. Overall, the Delphina group demonstrates that choice is a component of luxury; freedom to choose meets choosing to feel free. One had entered Sardinia keen to release the stresses of day to day life and ignore my checklist of things one needed to do and to remember that doing things that one enjoys is different from actually enjoying the things that one does. One certainly dined well and, having returned to England, I believe I am thinking wiser, loving clearer and sleeping healthier. Delphina Hotels provided time, space and, above all, the freedom to take a step back, breathe and reset. New to the writing team this year, Igraine (or Iggy for short) is making her name in the world of journalism, and we’re glad to have her on board with us. Iggy loves to travel the world in pursuit of the finest wine and the most Michelin of meals. The only thing she loves more is writing about it for our discerning readership.